We’re a couple of ordinary people in late middle age who left our careers early to live the rest of our lives as we want. For us it was a choice of having more money and less time, or less money and more time. The story of how we met is here. Karen and Jim on Sockdolager at the dock in Port Angeles. Photo by Mae-Jong Bowles. Short answer: We’re in love! With life, with each other, and with the idea of exploring together some of the far corners of this blue watery planet. We want to travel sea highways in the slow lane, learning, making friendships, and having experiences that might otherwise be missed if we were in a hurry. And we want to do it now, before we get too old. For the long answer, see The Crew, the Boat, and the Voyage. 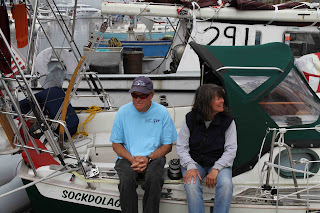 June 2011: Port Townsend, Washington, doing final prep for the voyage. Early July: At sea, southbound. Late autumn 2011: Mexico's Baja California. March-April 2012: Crossing the Pacific from Cabo to the Marquesas. May-September 2012: Cruising through French Polynesia, the Cooks and Tonga. Late November 2012: Crossing to New Zealand. December 2012-May 2013: New Zealand. June 2013: arrival (by container ship) in San Francisco. 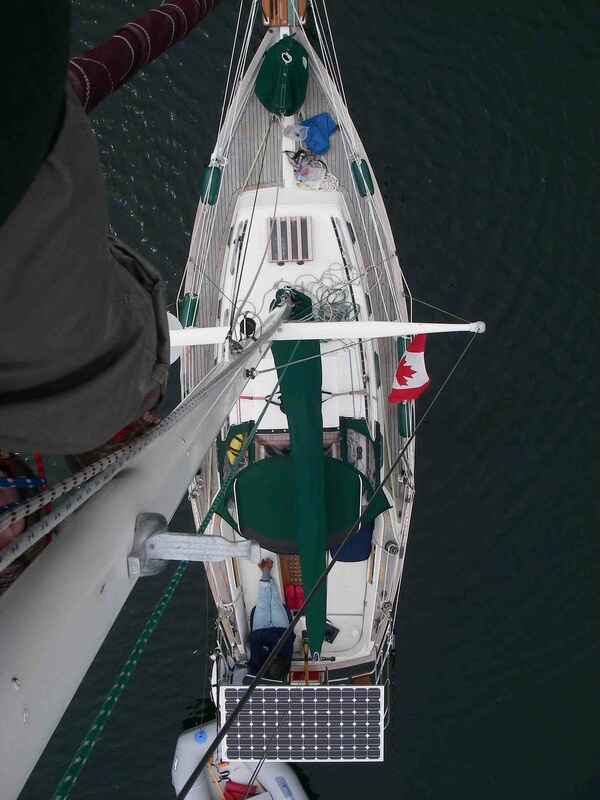 July-August 2013: Sailing home along the CA, OR, WA coasts. 2013-2017: Messing about with boats locally. May-September 2018: Cruising Canada and Alaska. July 2011: West through the Strait of Juan de Fuca, then south to San Francisco. Rest of summer 2011: Harbor-hop along the California coast to San Diego, where we’ll wait for hurricane season to end. November 2011: To Mexico. Plans are to cruise the Sea of Cortez for the winter. March or April 2012: Depart Mexico for French Polynesia. Sail throughout these islands and others in the South Pacific. 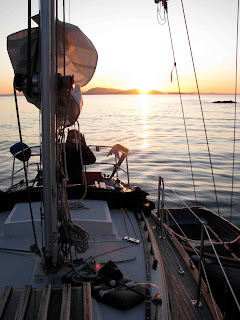 November 2012: Sail to New Zealand. November 2012-May 2013: Enjoy New Zealand. May- June 2013: Put the boat on a container ship, then go aboard the same ship as passengers and "sail" back to San Francisco Bay, arriving June 6 or thereabouts. June 2013: Enjoy San Francisco Bay again. July-August 2013: Have a leisurely cruise (we hope)* for 800 miles north along the California, Oregon and Washington coasts, to home. *It was an adventure. 2013-2017: Port Townsend, WA. Sockdolager was sold in October 2016, and we plan to continue cruising all corners the Pacific Northwest in our BigFoot 29 wooden powerboat, Raven. 2018: Alaska and Canada, off the beaten path. We don’t know. We know. See above question. Because we want to stay out there for as long as it’s fun. Could be two years, could be ten. 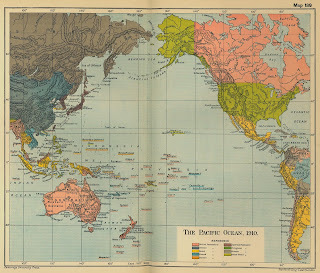 The Pacific crossing was a two-year voyage. BTW, it's still fun, but for many reasons we felt the tug of home. Now, northern waters beckon. Are you going near all those pirates? What kind of boat is that? Does it have a full keel? Sockdolager is a Pacific Seacraft Dana 24, designed by William Crealock and built in 1987. She’s 27 feet overall with the bowsprit included, has a modern full keel, is 8 feet wide, draws 4 feet, and weighs between 9000 and 10,000 pounds fully loaded. WHAAAAT? Twenty-four feet! Isn’t that boat too small? Small, sturdy sailboats have made some amazing voyages, including circumnavigations. A Dana is so well designed and built that it feels much larger than 24 feet. With 6’2” of headroom and loads of storage space, the cabin is plenty big (and comfortable) for two organized people to live in. Jim has spent countless hours designing and installing systems that make the boat safer, more comfortable, more self-reliant, and more efficient. Our shipwright and friend Leif Knutsen has designed and built ingenious solutions for small-space living. The boat feels cozy but not crowded. At anchor, the cockpit becomes another “living room” when we rig the awning. Sockdolager sails well, is easy to handle, and is small enough to usually find space in crowded harbors. 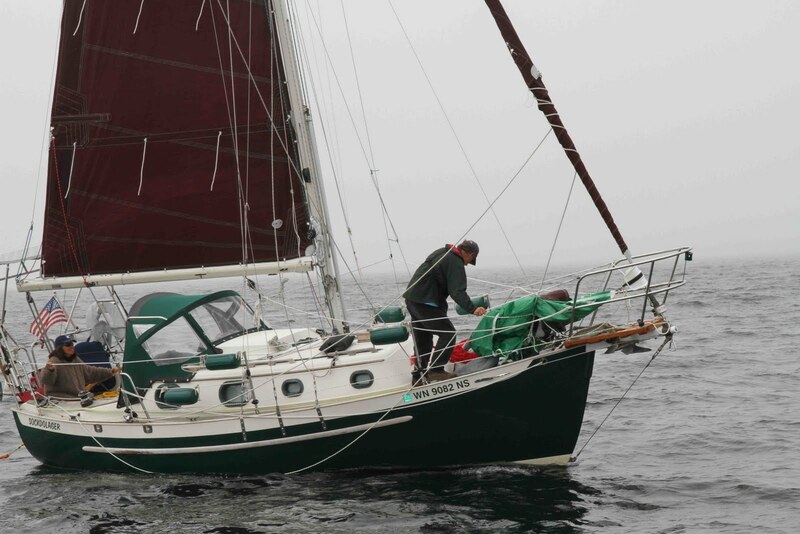 Karen has twice crossed the Gulf of Alaska in a Dana 24, and both passages were made safely and in reasonable comfort, even under gale conditions. Sockdolager may be small, but she was the right boat for us. No, I mean what kind of a sailboat is that? Like, is it a one-stick job or a two-sticker? Oh, you mean how is she rigged? 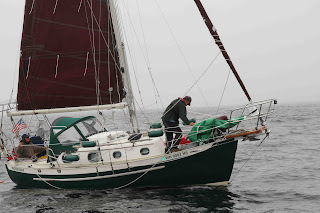 Sockdolager is a cutter, which means she has one mast but can carry two headsails (the ones up front). 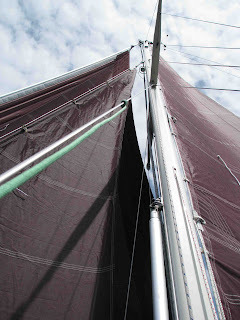 The inner forestay (wire thingy going from deck to mast) can be moved out of the way when we want to clear the foredeck for the genoa if we’re doing frequent tacking… oh never mind. Average speed for a lot of small cruising sailboats on passage is about 5 knots. A knot is 1.15 mph, so that’d be just under 6 mph. On passage, we’ll call it good if we make 100 miles per day. Currents affect our speed the same way a headwind or tailwind would affect an airplane. Why are your sails brown? It's called tanbark. Tanbark sails were traditional among fishing boats, especially Thames spritsail barges. The range of red-brown colors came from applying fish oil to the cotton sail cloth in efforts to preserve it from rotting; the oil turned the sails reddish with age and exposure to the sun. Now sail cloth is made of dacron, and you don't need to douse it in fish oil. We like the tradition, and think tanbark may be a bit more visible in fog. And a Dana 24's hull lines are an updated version of an old design for a fishing boat. How do you get ready for something like this? Can we have a tour of the boat? We love showing people our boat, and if we see you in an anchorage there's a good chance we'll invite you aboard (although it'll be on Raven, since we sold Sockdolager in 2016.) For now, look at the side page called "Fiddly Bits: Making a small boat safer and more comfortable to live on" for a tour of the things we've done all around the boat to improve her. Is there a blog photo album? What do you eat on a boat, and how do you cook? At sea we eat only raw Humboldt squid and drink straight rum. Just kidding. We have a two-burner stove with an oven and broiler, and can cook anything we’d cook on land. 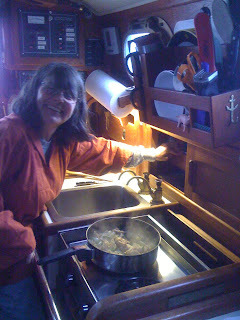 The big difference is when the galley’s being tossed around it’s hard to keep things on the stove or counter, so sailors tend to make one-pot meals or sandwiches, and snack a lot more in lieu of some meals. We keep hot water in a thermos for instant soups and tea. With seasickness, all bets are off, but on the positive side it’s a terrific weight loss program. After a couple of days at sea Karen tends to get ravenously hungry, and has even been known to bake. Where would WE sleep if we come to visit you? In a hotel. We’ll take you sailing if you let us use your nice hot shower. Okay, you’re on! I want to book a plane reservation. When exactly will you be in Tahiti? We don’t know yet. We were there in July 2012. That’s the beauty of cruising under sail. There’s no schedule. When you’re out of sight of land, do you drop anchor or run back to harbor at night? Neither. This comes up a lot. When a sailboat goes offshore, she stays at sea and usually keeps going 24/7, until she reaches her destination. Only then does she go into harbor and anchor. This means we stand watches--one of us is in the cockpit for a few hours, watching for ships or changes in the weather, while the off-watch person sleeps, reads, cooks, navigates or relaxes. Then we switch. Repeat until landfall. Does that island go all the way to the bottom? Seriously. Somebody once asked me this. There aren’t any road signs on the ocean, right? How do you keep from getting lost? Can’t you get to the South Pacific and back in a year? Well sure, if we didn’t bother to stop and see anything along the way. 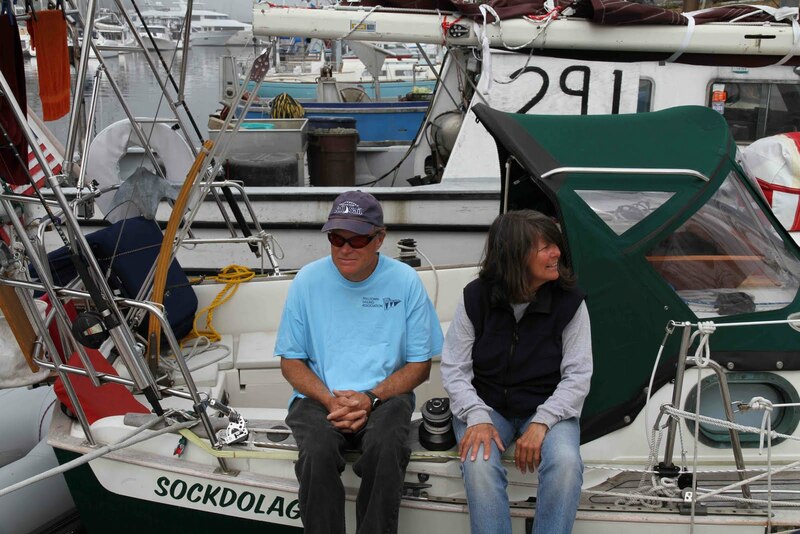 It’s nearly 800 ocean miles from Port Townsend to San Francisco. 500 more to San Diego, then another 600 to the south tip of Baja. It’s 2600 to 3000 miles from Mexico to the Marquesas, depending on where you leave from. Those are one-way distances. We can do about 100 miles a day on a good day. Do the math. For rushing, there are airplanes. Which islands are you going to visit? We left Washington State's island-studded shores in 2011 and sailed down the coast to California, which we loved. Its Channel Islands are superb. Mexico was next, and the islands north of La Paz enchanted us. Then it was a long sail across the Pacific, and we stopped in the Marquesas, at the eastern end of French Polynesia and visited most of its islands. The Tuamotus were next, followed by Tahiti, Moorea, Bora Bora, Aitutaki, Niue, Tonga, and now New Zealand. Now it's Alaska and Canada. We go where wind and whim take us. When you’re living on the boat anchored in some cove, what do you do all day? Read. Relax. Cook. Write. Take photos. Talk. Go ashore and explore. Meet new people. Play and listen to music. Carve driftwood. Work on the boat. Work on the boat. Work on the boat. (Need to emphasize a boat requires lots of maintenance.) Socialize with sailors and other people we meet. Swim if the water’s warm enough. Do chores--provisioning and laundry can take an entire day, but hey, we have time. In foreign countries, lots of time gets spent checking in and out with Customs and Immigration, and catching up with mail. If you’re away from an internet or cell connection on land, how do you connect to the internet? When you’ve been together 24/7 nonstop for umpty-ump days cooped up on that tiny little boat, how do you keep from tearing each others’ hair out? Lots of people ask this question. It’s always delivered sotto voce, with sideways glances, like the kind Jimmy Cagney used when he would ask Edward G. Robinson about doing a bank job. Although cruising is not without its moments, both of us retain full and healthy heads of hair. Most of the “moments” revolve around miscommunications. Not everyday miscommunications, mind you, like the time in Canada’s Johnstone Strait when Karen admired a sturdy ketch designed by the famous marine architect William Garden and said, “What a well-kept Garden ketch!” to which Jim replied, “Do you think they have any tomatoes?” No, not those kinds of miscommunications. We mean the dreaded gender-based, Mars-Venus, Yin-Yang, He said-She said, Why-can’t-you-read-my-mind kind. But from the three summers we spent sailing and sea-trialing the boat as well as each other, we have found that we can coexist pretty well in a small space. Why don’t you post something every day? Isn’t that what bloggers do? Because we don’t want to set up an obligation that, if not met, might cause some people to worry that something’s wrong. And because not every detail in our lives is interesting (gasp!) we don’t want to bore you with what-we-ate, or gosh-what-do-I-write-today doggerel. Blogging can be work, but also great fun. For me (Karen), the fun comes in storytelling. When we have something to say, we’ll say it. Stories and vignettes and lots of photos are what you’ll find in here. You both were single-handed sailors? Really? Wow, those are the best prostheses I’ve ever seen. Amazing what modern medicine can do. What are self-tailing winches? Do they follow you around the boat? You may be confusing those with the saucy wench who follows Jim around the boat.